The Pittsburgh Pirates have reportedly given manager Clint Hurdle a four-year extension. Both Hurdle and the Pirates have declined to confirm the extension. But the Pittsburgh Post-Gazette is reporting that Hurdle and the team have a deal in place for Hurdle to remain manager of the Pirates through the 2021 season. The deal will replace the team option the Pirates had on their manager for the 2018 season. While Hurdle declined to confirm the extension on Monday, the manager spoke openly about his desire to remain in Pittsburgh in the years to come. Among active managers, Hurdle is among the most accomplished in baseball. He’s accumulated over 1,100 managerial wins, despite having a losing record. He spent more than seven years as manager of the Colorado Rockies, leading them to the World Series in 2007. Hurdle took over the Pirates in 2011, leading them through the end of their rebuilding process. In 2013, Hurdle was named National League Manager of the Year after leading the Pirates to the Wild-Card Game, Pittsburgh’s first playoff appearance in more than two decades. The Pirates won that game and advanced to the NLDS. Hurdle and the Pirates earned a wild-card spot in each of the next two seasons, despite losing the Wild-Card Game each time. Unfortunately for the Pirates, they have taken a small step back in 2017. However, Pittsburgh’s struggles can hardly be blamed on Hurdle. Starling Marte missed 80 games with a suspension. Gregory Polanco has endured three separate trips to the DL. Jung Ho Kang ended up missing the entire season after failing to secure a visa too close to spring training for the Pirates to replace him. The team’s starting rotation has also failed to live up to expectations. With Hurdle reportedly agreeing to an extension, the next step for the Pirates is giving GM Neal Huntington a similar extension. Huntington also has a team option for the 2018 season. However, Pirates president Frank Coonelly has previously stated his intent to keep both Hurdle and Huntington in Pittsburgh over the long haul. Despite Pittsburgh’s struggles this season, giving Hurdle an extension is the right move. After years of futility, he helped make the Pirates relevant in one of the toughest divisions in baseball. Hurdle has proven to have a great handle on his team and the respect of the clubhouse. 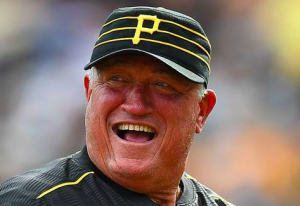 The Pirates would be hard pressed to find a better manager than Hurdle. Giving him an extension is the right move for the franchise.